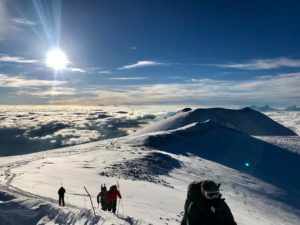 Successful summit for Jim on Elbrus! We’re a little behind on posting this blog, because the guys moved so fast! 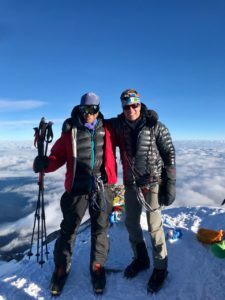 Gaspar and Jim took advantage of a small weather window on Friday morning and decided to make a bid for the summit. They took off in the dark and working together as a team they made the summit at 5:30am in time to catch an incredible sunrise. Gaspar said they had no wind and clear sky’s, making for a great climb. The guys made quick work of their descent and in fact have already made it back to St. Petersburg by the time we’re posting this blog on Sunday. Efficient logistics and flexible schedules are what make for a great expedition, and here at Alpenglow Expeditions we work hard to stay open to all possibilities. Jim will be joining us for our Aconcagua Rapid Ascent expedition in January. We are very excited to welcome him to another Alpenglow team where he’ll be a strong member on a physically demanding climb. Can’t wait to climb with you again Jim! Congrats on a stylish summit in Russia! For more information on our Elbrus expeditions, or any of our other international expeditions check the expedition finder on our website. For any questions call our office at 877-873-5376 or send us an email info@alpenglowexpeditions.com. We hope to climb with you soon!